Brrr!!! It's cold outside! In this coldest month of the year, let's take a look at five new perennials coming this spring that are cold hardy all the way down to zone 3—that's -40°F! If you lose a few plants during this arctic winter, consider replacing them with these cold-loving beauties. Every perennial garden needs at least a few salvias, as they are a favorite of pollinators and bring much-needed color back into the garden after a long winter. 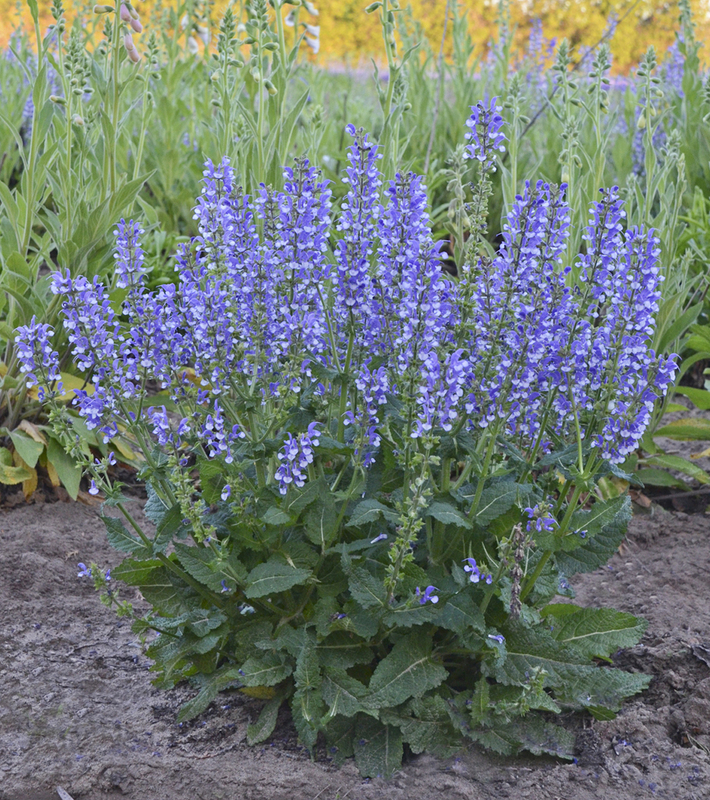 The new 'Azure Snow' salvia blooms in late spring with plump wands of bicolor violet blue and white blossoms that stand at attention above the dark green, basal foliage. Its minty fragrance keeps rabbits and deer from nibbling, but its flowers are a favorite of bees, butterflies and hummingbirds. Grow 'Azure Snow' salvia in a very sunny spot in the landscape or in containers. 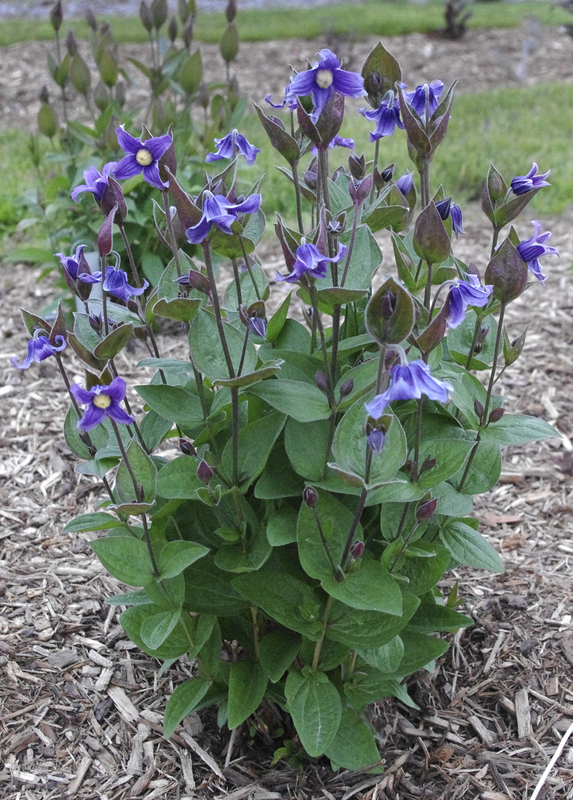 Once it's established, it prefers somewhat dry soil, so don't plant it in a spot that is watered frequently. Try pairing it with annual Luscious® lantanas, Festival Star™ baby's breath or Double Play® Blue Kazoo® spirea. Goatsbeard may be the most versatile perennial you've never heard of. That's because until now, there were very few forms available. This new mid-sized, super hardy perennial grows and blooms well in both sun and shade conditions and pairs well with just about everything in the landscape. 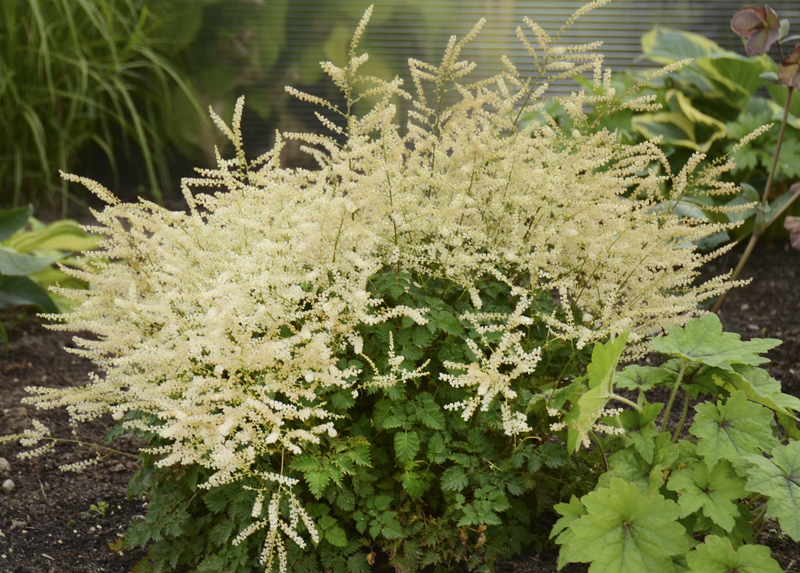 'Chantilly Lace' goatsbeard looks a bit like astilbe, but it's easier to grow since it doesn't require constant watering. It also blooms earlier in the season, typically in late spring to early summer. Try pairing it with Shadowland® hostas, Dolce® coral bells, and Opening Act phlox in the landscape. Goatsbeard is a very low maintenance perennial. You'll want to deadhead the spent blossoms once when the plant is finished blooming, but no other pruning is required. Plant it in a flower border that is irrigated weekly along with the lawn, feed it once in spring, then watch it thrive the rest of the season. You may be familiar with vining clematis, but did you know that some varieties grow more like upright perennials? The new 'Stand By Me' is a great example—it grows about three feet tall and doesn't twine or vine. It appreciates the support of neighboring plants like 'Storm Cloud' Amsonia or 'Totem Pole' switch grass once it's reached its full height and is full of flowers in late spring to early summer. Its blue, nodding bell-shaped flowers often make a second appearance in later summer months, and attractive seed heads follow the blossoms. 'Stand By Me' clematis grows well in sun and light shade and prefers well-drained, slightly alkaline soil. Mulch or shade the roots with neighboring plants to keep them cool. Clematis likes to grow with its roots in the shade and its foliage in the sun. Pruning should not be necessary, but if needed it can be done in late winter or early spring. If your winters are bone-chilling cold and your summers are hot and dry (or you lack sufficient irrigation), hardy penstemons are ideal perennials for your garden. Once established, these durable native prairie plants thrive in such conditions and offer showy blossoms that draw in the hummingbirds. 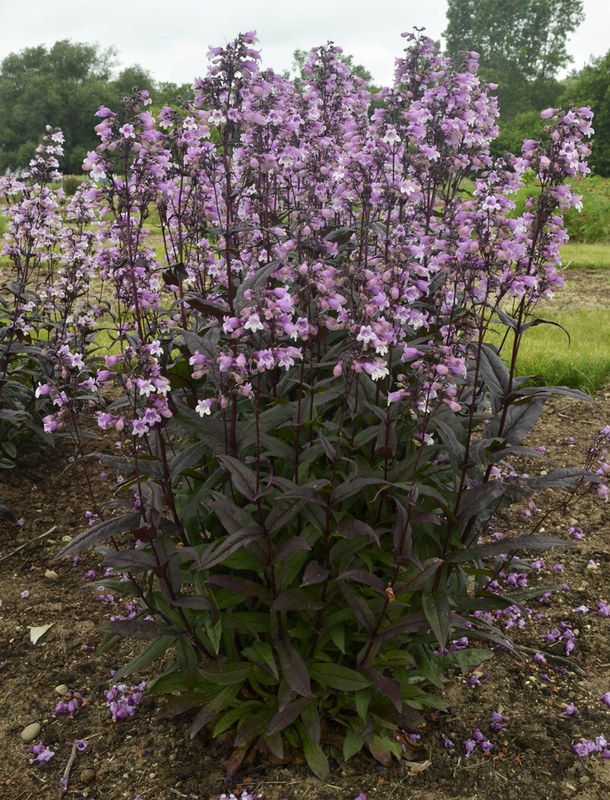 The new 'Midnight Masquerade' beardtongue is the total package, with both attractive flowers and foliage. Tall spikes lined with lavender purple flowers appear for several weeks in summer, and deep purple foliage keeps the garden colorful all season long. Try pairing it with 'Denim 'n Lace' Russian sage, Rock 'n Grow® sedums and Prairie Winds® 'Blue Paradise' little bluestem grass in a sunny spot in your landscape. 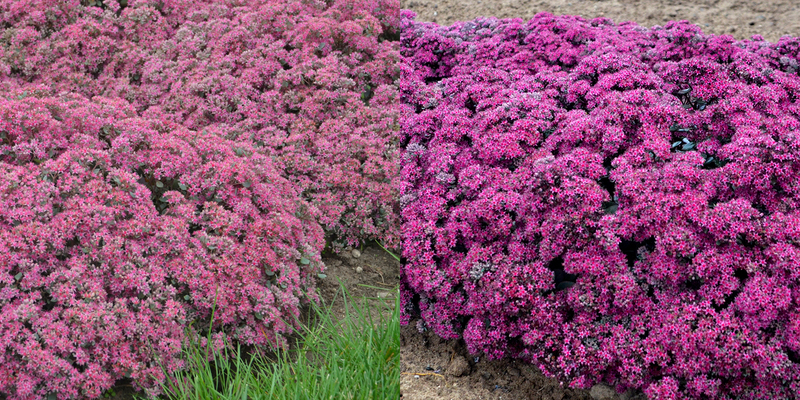 This perfectly pink duo of low growing, hardy sedums would look amazing planted in pockets on a stone wall, covering a sunny slope, or edging a pathway. An easy, low-maintenance combination for zone 3 could include 'Popstar' or 'Superstar' planted with Low Scape® Mound chokeberry, and Good Vibrations® Gold juniper. Succulents are extremely popular for their low water needs and fun foliage. 'Popstar' and 'Superstar' offer the added bonus of extreme cold hardiness and masses of flowers. Their glowing blossoms completely cover the foliage from late summer into fall, followed by attractive seed heads that keep them looking great until the snow flies. You'll often find bees and butterflies sipping their sweet nectar. Grow these plants in full sun. Water and feed them very infrequently once they are established. Lean, dry soils will result in more tightly mounded, colorful foliage and increased flower coverage. Want to see more? Discover over 200 varieties of Proven Winners perennials here.